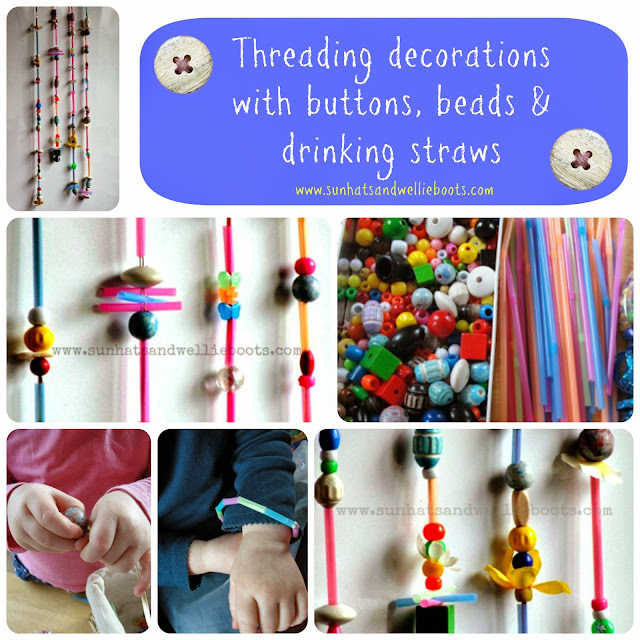 Sun Hats & Wellie Boots: Threading with Straws, Buttons & Beads! Threading with Straws, Buttons & Beads! 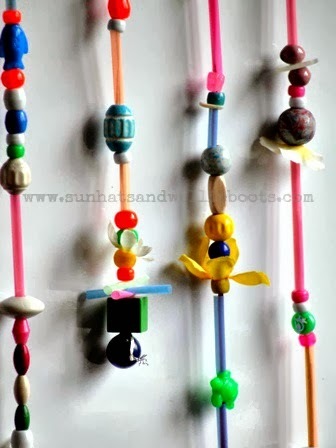 Here's an activity to add a little bit of colour to any dull day, & a great way to practice some fine motor skills. Minnie is showing lots of interest in threading things & is managing to manipulate string & objects really well . We have some cotton reels & large plastic buttons which she loves to make into ‘necklaces’ & ‘snakes’ but I thought I’d offer something a little bit different for her to explore. 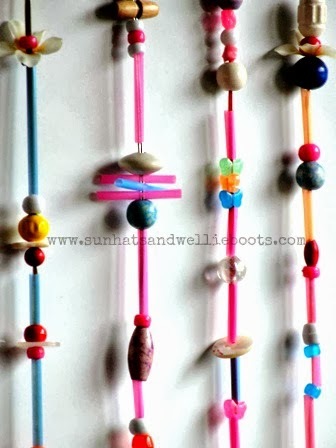 I had a look through an old button box & found buttons, pieces of broken necklaces & beads. Minnie has a nice collection of bright coloured beads in assorted sizes & shapes so I added these to our collection of treasures. 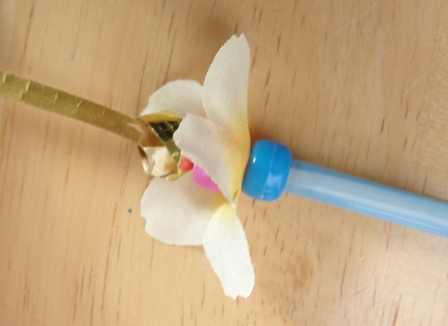 I also found some old silk flowers which I gently pulled apart so we could use the fabric flower shape, some ribbon, scissors & coloured drinking straws. 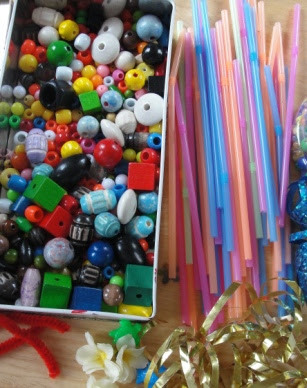 Minnie started by cutting the drinking straws into small pieces, these were to become our beads. They were all different sizes but it didn't matter, it was great to just watch her happily snipping away at the straws (although I did find several on the floor after the activity as they have a tendency to fly!) 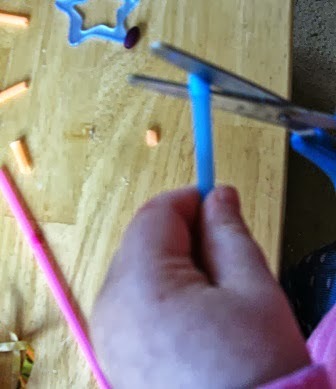 As she cut the straws I was able to introduce the concept of length. She then selected a bead & threaded it on the ribbon, I tied a knot around the bead to secure the end, & Minnie decided what to add next. It was lovely to observe her as she carefully threaded the different objects onto the ribbon, & watch her creativity flow at the same time! 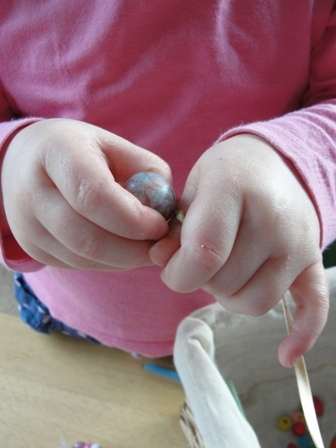 Sometimes she needed a hand to thread a smaller bead, & once I had pushed the ribbon through she took control again. When an object was too small for the ribbon this gave us a great opportunity to talk about size, & compare smaller & larger shapes. It was also a great way to explore patterns & colours. When Minnie had finished threading I tied a knot in the ribbon to secure the decorations. They look so bright & pretty, perfect for cheering up a dull day! We went outside later & hung some in the garden to make a cute outdoor mobile. It was so relaxing to watch them swaying in the breeze & a great way to add some colour to the garden too. 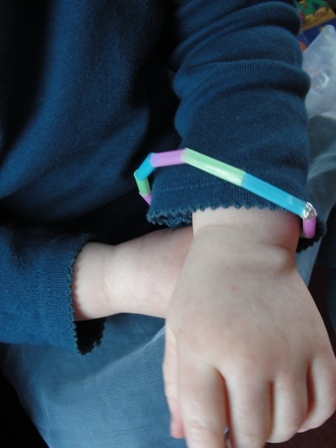 This is a great activity for encouraging hand-eye co-ordination & fine motor-skills. 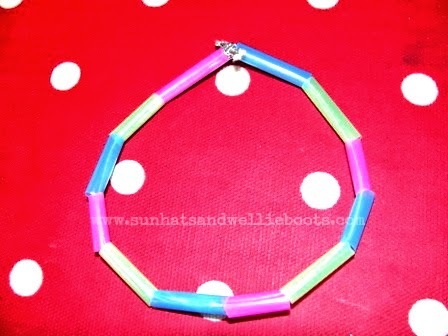 With our left over straws we made some bracelets & necklaces. We simply threaded the remaining small straw pieces onto some thick elastic, & then tied the elastic together in a knot to secure. Who’d a thought the humble drinking straw could be so pretty!